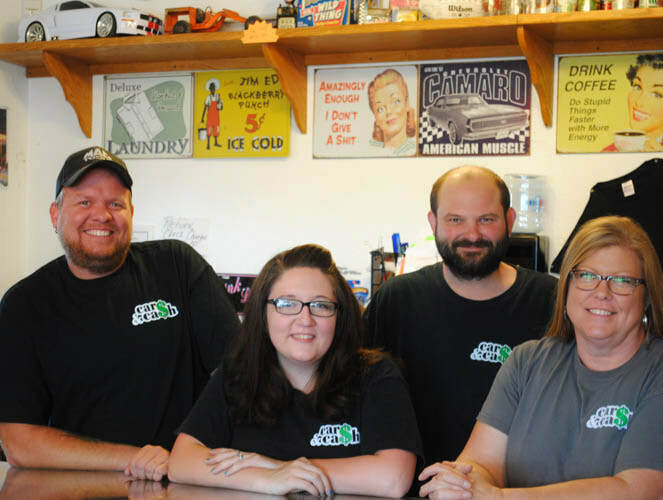 ​Cars & Cash is very much a family business. Jakki Short is the owner. Taking care of people has always been important to her and that is why this business is perfect for her. She is very well aware of the financial challenges that people are faced with and is happy to be able to help people meet those challenges, whether it be providing a Pawn or a Payday Loan that provides the money to meet a family’s needs until their next payday or helping somebody that is struggling with obtaining the credit needed to purchase a vehicle. Cars & Cash offers different financing options that helps customers with this including in house financing. Jakki shares a home with her best friend and significant other Kenny, her youngest daughter Randi and their 3 dogs Willy, Gracie, and Maggie. Jakki has 6 children and Kenny has 3 children giving them a total of 9 kids and 10 grandchildren. And anybody that knows Jakki knows her grandkids are absolutely the light of her life. All of their employees play a very important part in running the business and are very valuable assets. Gary Short AKA Fonzi Short, Jakki’s son is also employed with Cars & Cash. Fonzi has worked for the family business since he was in high school and is in charge of everything (or so he thinks) ☺ Seriously though, Fonzi is in charge of buying all the vehicles for the business and keeping the garage running smoothly. Fonzi has had a thing for cars since he was a toddler, and by the age of three he could tell the difference between a Ford and a Chevy truck. He also loves to go to auctions and buy “stuff” known to some people as junk. This makes his job at Cars & Cash great for him as he gets to attend auctions every week to buy cars and he doesn’t even have to spend his own money! Fonzi collects Chevelles, and anything vintage that has to do with cars and kids. Yes I said kids, Fonz shares his home with Shirley and SIX kids! Fonz brought 3 kids into the relationship Emma, Gary and Rowdy. Shirley brought 2 kids into the relationship, Bobby and Carter. And together they had Memphis. To say that their house is crazy is an understatement, but it is definitely ran like a well-oiled Chevelle! Nikki Is Jakki’s oldest daughter. Cars haven’t always been Nikki’s thing and neither has the family business. feeling like it was time for her to get into the business and help mom. business. Nikki is very helpful with navigating social media and advertising. was in diapers. Todd has worked a couple of other jobs but has spent most of his adult life working here. preparing the vehicles for sale. Todd shares his home in Agency with his dog Gus, Todd rescued Gus from the Heartland Humane Society. Cash was born in a run down garage in Eldon Iowa. His life was destined to be a life of hunger, loneliness, and cat fights and crime. Luckily that garage belonged to friends of Jakki and Kenny"s and told them about the kittens. Jakki said if one of them is yellow she wanted it for the shop. So as soon as he was old enough he moved to a comfy inside home. Cash is now in charge of rodent control and people greeting. Most people really like him he has quite a personality. Even though he was taken in at a very young age he still learned some tricks of living on the streets. Yes Cash is a pick pocket!! No worries though he isn't very sneaky about it, its pretty hard to miss the giant cat trying to climb in your hoody pocket for your lighter or keys.